Affordable Signs uses the newest digital technology to deliver the highest quality in large scale and custom print work. With state of the art, large format digital printers, Affordables Signs can produce photographic quality for outdoors and indoors displays with no minimum order limits. We provide custom banners, wall art, light lenses, and flags , wall and door murals, photos and street banners up to 38" wide. We can print on various substrates such as satin, tyvek, backlit film, various papers and vinyls, and direct print nylon. See through window graphics help make your storefront look professional. 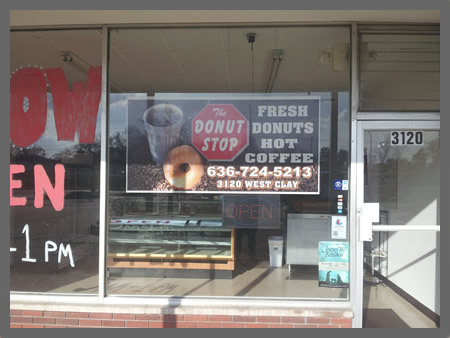 With see through window graphics from Affordable Signs, you can cover your business windows without the worry of blocking visibility or trapping customers. The distinctive perforated material from which see through window graphics are made allows for full-color printing on the outside, while being see-through from the inside. See through window graphics are the best choice when you want to cover your entire storefront. From diffusing light and cutting glare from the sun to adding privacy, the advantages of see through window graphics are numerous. See thru window graphics get the attention of customers and encourage them to come inside to see what your business has to offer. Choose Affordable Signs when you need high-quality, custom see through window decals. See through window decals from Affordable Signs are fully-customizable. Another great option is to use see through window decals to feature various messages on your separate window panels. Our high-quality digital printing produces beautiful, vibrant images on view thru vinyl. View thru vinyl is perforated with 1.5 mm holes in a 50/50 pattern, meaning that 50% of the mesh window graphics are removed. This leaves enough printed design on the view thru vinyl that customers can easily read your message and see your images, however enough of the material is removed to allow for see-through visibility from the other side. Since view thru vinyl has an adhesive backing, it is generally installed on the outside of the glass. View thru vinyl is long-lasting and durable, and it's also fairly-easy to install (the perforations help prevent the bubbles and wrinkles that are common with solid materials). Our typical production time is 2-3 business days, so if you need to makeover your storefront quickly and effectively, let Affordable Signs help you view thru vinyl. See through window graphics from Affordable Signs are a great investment for any business looking to attract new customers and clients. With custom see through window decals, you can send a targeted message without blocking out visibility through your windows. View thru vinyl makes on-site marketing easy, so order today! Printed seals added to the back of an envelope make any letter or invitation seem more special. Adhesive seals are round but may come in different colors and have decorative edges. Personalize your seals by adding text or a graphic to the center or around the circumference of the sticker. Make seals that show some holiday cheer or team spirit.